Two weeks done and in the book, and I’m still loving it. 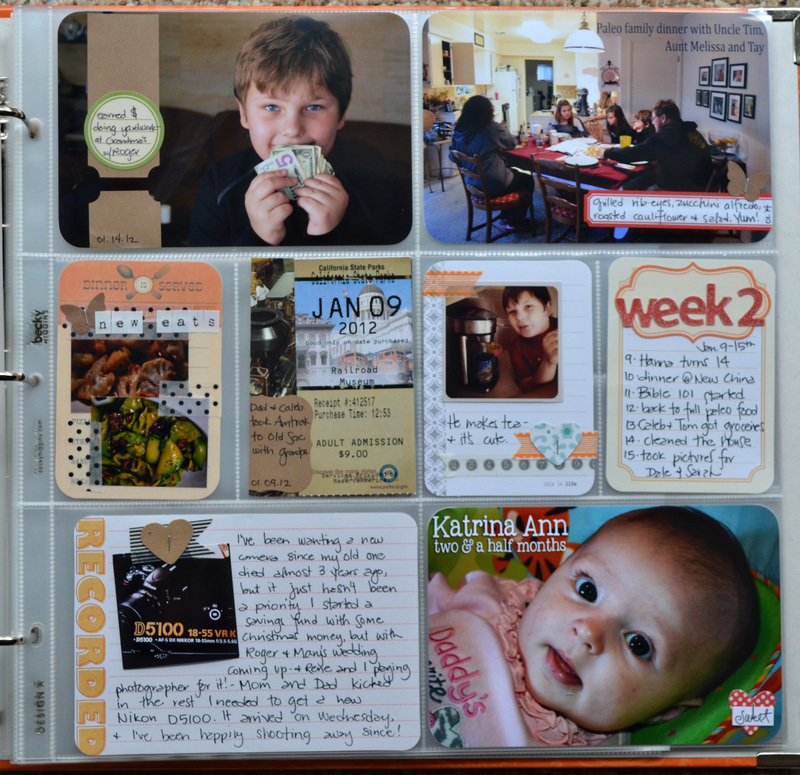 With 30 minutes to pick and order photos and plan, and another 45 minutes to put it together, this is the perfect form of scrapbooking for our lives right now. I love that I can be as simple or as elaborate as I want. This week, I really chose to strive for simple – it was our first week back at school after Christmas break and I felt like I was running all week long. Even with all that general craziness, I was able to carve out all the time I needed to come up with a spread I love. 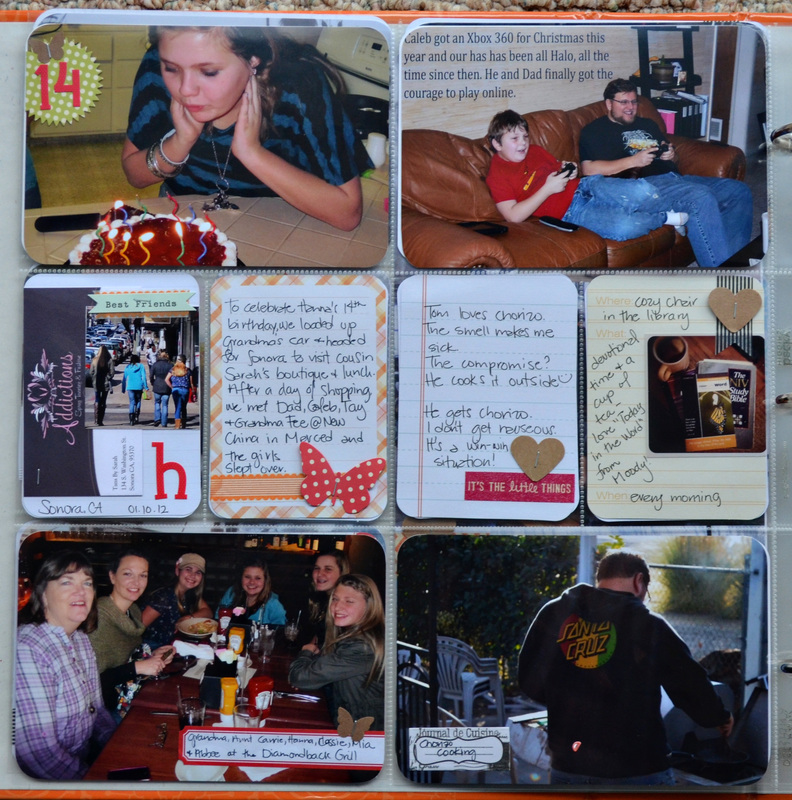 The first page – I didn’t want to add a whole insert for Hanna’s birthday, and putting it all in the same column worked out well. I can see myself doing that again, as space permits and the need is there. I love the way those bits of memorabilia look, but I really need to work on remembering to keep them. The second page – more stories. I’m not positive I love typing the journaling or notes directly onto photos, but it saves a bit of space since my handwriting can be big. 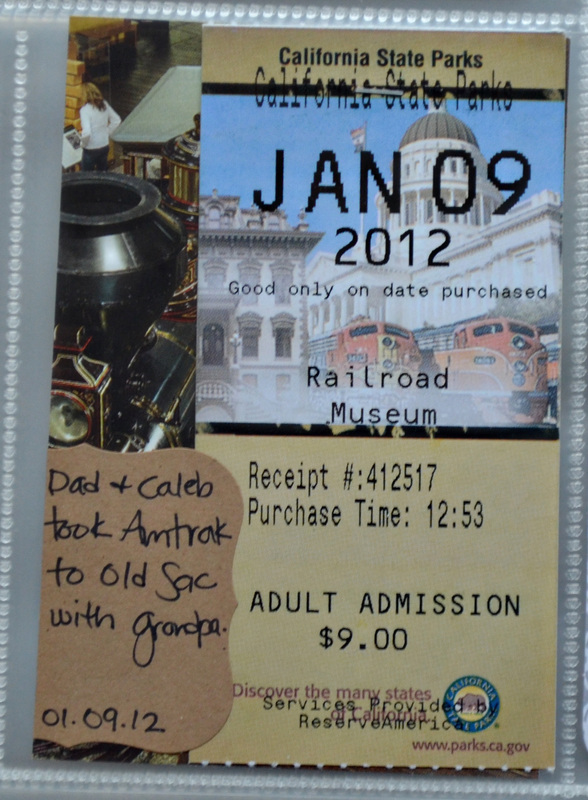 Caleb and Tom went for a train ride with Grandpa to the California Railroad Museum in Old Town Sacramento – something definitely worthy of including. I didn’t have any pictures, but Tom did bring home a brochure and their tickets, which made it easy to put together a little insert. And that’s why I need to get better at keeping memorabilia! This week’s Week in Review card – I was hoping last week to be able to include these every week. 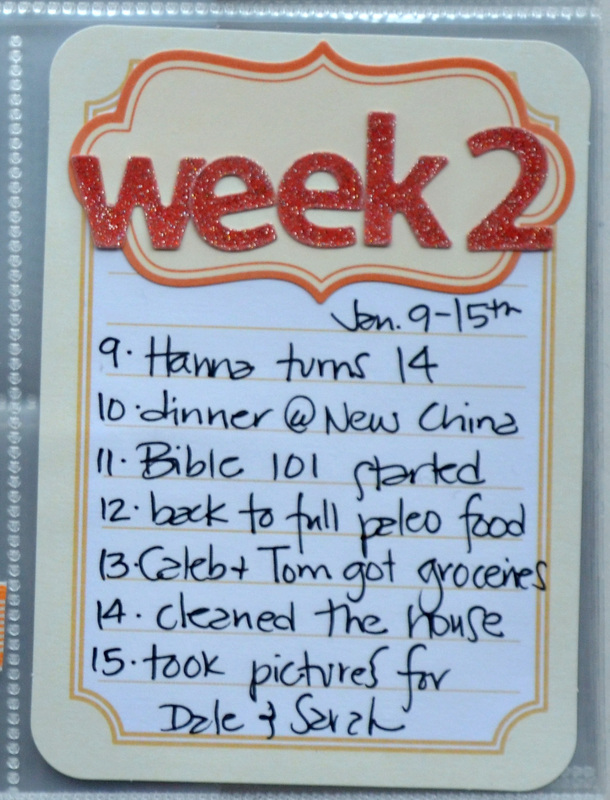 Not sure that I can, but I love that I can jot down other little bits and pieces of our week. I still haven’t gotten around to having the kids journal…I still don’t know if I like rounded corners or squared…I’m still fighting with myself over which stories get told…I still haven’t added in any Facebook status updates or tweets or texts…and I still want more journaling. I did learn more about what I like and what I don’t. I learned that super simple is okay. I learned that each and every week has a different story to tell, and it’s okay to let some stories wait. And I’m loving the process. 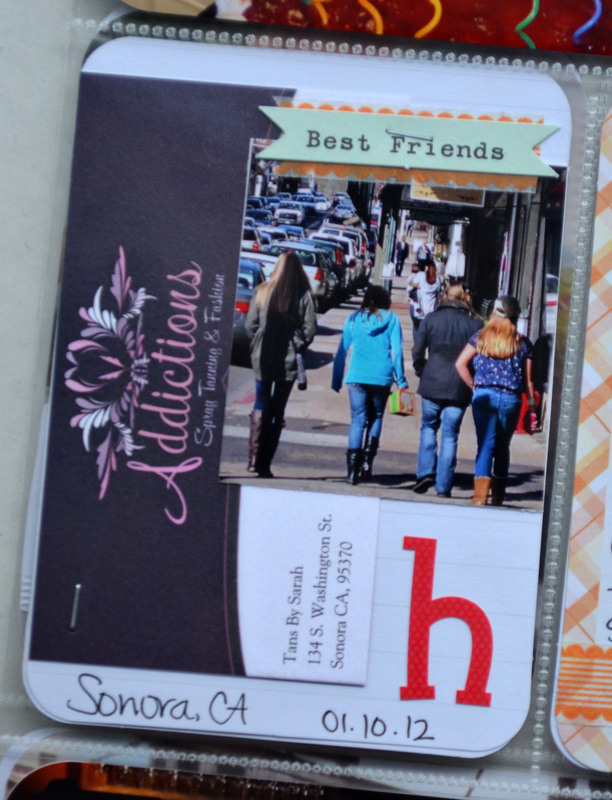 This entry was posted in Project Life and tagged Project Life, scrapbooking by Awkward Girl Gets Fit. Bookmark the permalink.